When your new husbands wedding gift to you is a new puppy, you know that your wedding day is sure to be the best day ever! This was such a whimsical wedding, I cannot contain my excitement to share this enchanting day with you! Katie and Rob were married on the Orcutt Ranch, surrounded by breathtaking trees and over 100 years of history. 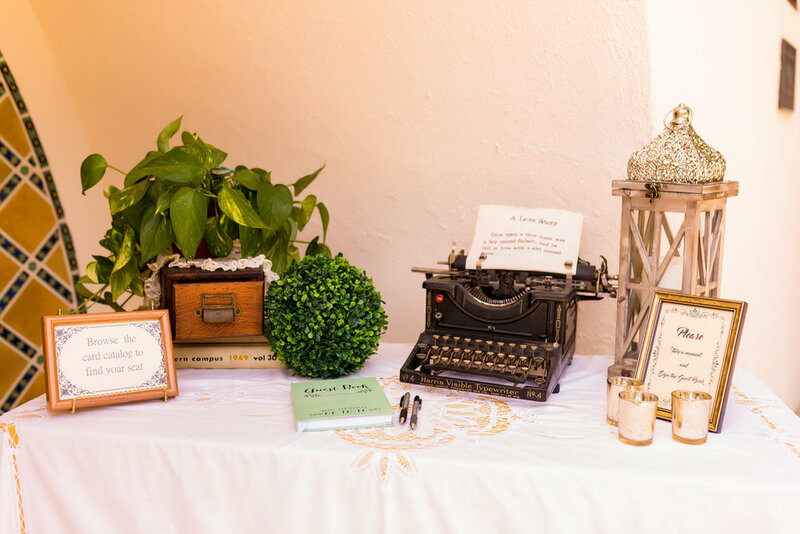 Her career as a librarian and their shared love for classic novels provided the inspiration for this very literal garden wedding! Pun intended! As the Bride's father gave her away he met his new son in-law at an alter of draped beauty - A custom built bookshelf surrounded by bellows of muslin fabric and a wine blending display in vintage style crystal - every detail carrying complete meaning to the couple. Brilliant Bride: The Crystal Carafe's with the remaining, unblended wine were gifted to the parents as a token of love and appreciation.